Every character has a story #40: U+202a, that control freak of a character! I promised myself I'd get into this some day. As it turns out, today is some day! have wreaked havoc in both plausible and implausible ways (sometimes with Freddy Krueger narrating, sometimes with Mark Davis or Asmus Freytag or Ken Whistler! All of these codes are limited to the current paragraph; thus their effects are terminated by a paragraph separator. Anyway, thanks, Hafthor. Sorry it took so long to cover it! 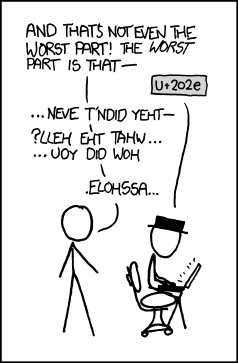 The LR/RL stuff in Unicode is insane. Too bad they never got all the bugs out of autodetect.